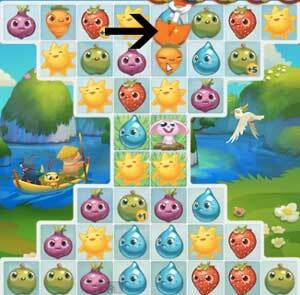 These Farm Heroes level 201 cheats and tips will help you beat level 201 of Farm Heroes. 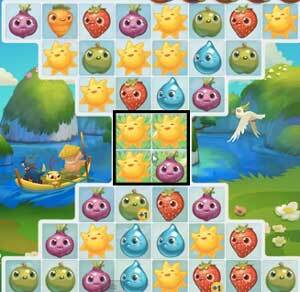 The objective of Farm Heroes level 201 is to achieve 100% growth and collect 30 apples, carrots, and strawberries in only 20 moves. Level 201 Cheat #1: Watch out for the pesky rabbit! The annoying rabbit is back and you better keep an eye for him. He’ll pop up at random, at any time and any place, just so he can take your much cherished cropsies. To stun him for a couple of moves, simply make a match adjacent to him and he will leave you alone for a bit. A good way to save moves is to stun the rabbit by making matches of cropsies that you need for your objective. This way you have a win-win situation: the rabbit can no longer take your cropsies, and you have gotten closer to your objective. The shovel booster is a great tool for this board. The shovel will help you remove certain items that are in your way, such as cropsies, eggs, or flowers. 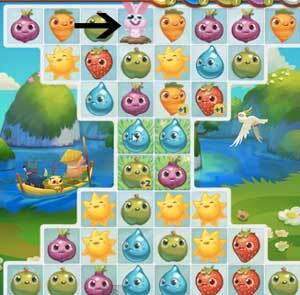 Use the shovel to remove a crop or item that is preventing you from making a match of apples, carrots or strawberries. For instance, it is going to work great against the rabbit to keep him from eating your cropsies. Use the shovel as best as possible by determining what your first concern is at the moment; be it to eliminate the rabbit or to collect a match of a certain cropsie. And remember, using the shovel will help save your moves because using this booster does not actually use up any moves. It is a helpful trick if you notice that you need a quick saver if you are low on moves and nearing the end of a level! In the narrowest part of the board you will find that you have a patch of grass covering 4 squares. It may not be much, but you will need to take advantage of it, because the grass offers a few benefits. Create as many matches of apples, carrots, and strawberries as you can there so you can receive the cropsie bonus that makes your collected cropsies worth a higher value – it will help you achieve your goal faster and with less moves! Also, if you have any grumpy cropsies that are messing up an otherwise perfect match, you can make them happy by shifting the board down so that they touch the patch of grass. Think of it as a kind of funnel for grumpy, worthless cropsies on top to come out as happy, valuable cropsies on bottom! Hopefully you will find these tips very helpful for beating Farm Heroes Saga level 201, good luck!